Ashburton Grove - Arsenal news and Arsenal opinion: Gervinho provides the spark but where were Wenger's options on the bench? 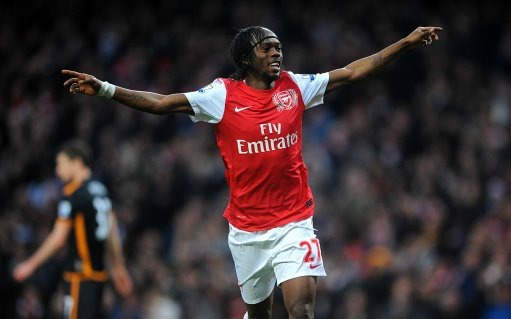 Gervinho provides the spark but where were Wenger's options on the bench? There are times when you can't believe your luck and despite doing the best with what we had on the pitch yesterday, there appeared to be no way to get past Wolves, once they had got their goal. Pre-match we knew that were we to win the game and take three points, fourth place would be ours. However, as we've seen many times before, the heroics of the opposition team's goalkeeper prevented us winning. It was a game I was expecting us to win. I had believed this team was mentally mature enough to do a professional job on Wolves and take all three points. However as soon as we didn't put the pressure on them after we'd scored our first goal and added a second, we were going to be in trouble if they put the ball in Wojciech Szczesny's net. Arsene Wenger made four changes from the side which won at Aston Villa. Johan Djourou returned to fitness and replaced Francis Coquelin at right back. Alex Song returned to the side from suspension in place of Emmanuel Frimpon. Yossi Benayoun came in for Aaron Ramsey as the Welshman was dropped to the bench and Tomas Rosicky started in place of the ill Theo Walcott. There were a couple of early scares for the Gunners defence, with Matt Jarvis being the orchestrator of the two moves. One shot fired in was beaten away by the legs of Per Mertesacker. The other chance was a dangerous cross. Arsenal went ahead after eight minutes. Rosicky fed Benayoun and the Israeli found Gervinho who had made a darting run from left to right and beat the offside trap. With an exquisite pirouette, he took the ball into the box, showed the goalkeeper one way and then shot into the open net on the other side. Then came the period when we did our best to add a second goal but it wasn't to be. Robin van Persie shot wide, Benayoun had a chance, Arteta fired wide, then the Dutchman made Wayne Hennessey produce a fine save. Arteta took a free kick which was so tame it was more like a back pass to Hennessey. Then came the moment when we conceded and it was totally against the run of play. Mertesacker conceded a corner. It was headed away by Djourou but only as far as Hunt. His shot was going well wide but found Fletcher's head and he sent the ball in to Szczesny's bottom right hand corner. It was a fluke goal. Nine out of ten times that would never happen again. Fletcher happened to be in the right place at the right time and there was nothing Szczesny could do to save the header. At half time it was level and I expected Wenger's men to be fired up to take the second half by the scruff of the neck and put Wolves to the sword. For the second time in as many weeks it was a refereeing decision when it came to awarding us a penalty which would spark anger amongst the crowd. Stuart Atwell decided to book Thomas Vermaelen for protesting about his decision not to award us a spot kick when the ball clearly hit Christophe Berra's hand from a Koscielny’s cross. It appears that you can now play rush-goalkeeper in the Premier League, certainly against Arsenal it seems. First the Micah Richards decision at Eastlands. Now Berra's handball at the Grove. It appears that two different referee's in Phil Dowd and Atwell have a new interpretation of the rules. Or they're just crap referees. Things weren't going our way as Wenger replaced Benayoun with Arshavin with 25 minutes of the game to go. The Russian's introduction saw us work that bit more harder to score the second goal. By this time Szczesny was a spectator in his Clock End goal. Van Persie had a free kick pushed over the bar and Mertesacker had an effort saved by Hennessey. The Welshman in the Wolves goal was having a Jussi Jaaskelainen day against us. Everything we shot at him he saved. The crowd had been whipped up mainly due to Atwell's inapt performance and because the Gunners couldn't break through a stubborn Wolves defence. The visitors were reduced to ten men by the official for what appeared to be a harsh red card. Milijas was adjudged to have made a dangerous tackle on Arteta. Even being a man down, Mick McCarthy's team didn't play any differently with the remaining nine outfield players making it as difficult as possible for Wenger's side. The introduction of Aaron Ramsey for Alex Song made a difference. It appeared the Cameroon international was losing his head and the boss took him off before he found his way into Atwell's book for a second time. Rosicky, van Persie and Arshavin had chances, with the Russian's shot just inches wide of the left hand post. The Arsenal captain had two more efforts saved as he looked to go past Thierry Henry's 34 goal calendar year record. The Frenchman watched on from the stands as the Gunners huffed and puffed but couldn't breach Hennessey's goal. There was pretty much a siege on the Wolves goal for the final ten minutes as Wenger brought on Chamakh for Djourou. Koscielny and Vermaelen had efforts as we pressed so hard for a winner but it was not to be. A draw was greeted by celebrations from the Wolves players. Gooners were less than pleased that two points had been dropped. "It is frustrating but I am more frustrated by the result than the performance and the spirit. You cannot fault the attitude or the commitment or the desire to win the game. We missed a great opportunity but we just have to keep going and take the positives out of the game today." Unfortunately we're going to come up against teams like Wolves and Fulham who will want to park the bus against us. And it's not like we didn't have our chances. I'm not sure if the calendar year goal scoring record is a monkey which we need Robin to have on his back. There has been much written and talked about it and personally I don't believe it is helping him, with the pressure he's under to lead the team and to be the main goal scorer. You can't be a one man team when other players are scoring. Robin had no involvement in the goal other than to make a run in the opposite direction of Gervinho. And perhaps the pressure on him to beat Alan Shearer's record is getting to him. He's got one chance left to do it against QPR on Saturday and then hopefully we won't have to hear of this calendar year record again. Two point were dropped yesterday and I don't believe it was down to a lack of effort from our players. We had a goalkeeper in Hennessey who was in fine form to beat and then we had an official in Atwell who appeared to lose control of the game. They won't be a factor on Saturday, when we must return to winning ways.